To imagine that the Gray FishTag Research program is under a year old and has already seen positive results and cooperative involvement is truly humbling. As some of you may know, the idea of a multi-species fish tagging program had been brewing at Gray Taxidermy for several years. We knew that we had the pieces to put it all together, we just had to find the right time, platform and partnerships to get it off the ground. After traveling the globe for over two years and talking and listening to fishermen, marina owners, conservation minded groups as well as marine scientists we felt that our program could connect all parties. Catch and release fishing has been advocated for some time by sport fishermen around the world. On the anglers’ side, there seems to be a void of excitement and interaction with the overall fishing experience. The anglers want photos and a personal connection with their fish. Our version of a fully cooperative multi-species fish tagging program could fill the void that the angling customers have been looking for while achieving the highest level of conservation. We have proven it was just a matter of providing the Captains and crews with the proper support and equipment (tag sticks, tags, data cards, how-to information, and an interactive website) to effectively involve the professional fishing community into providing constant, desperately needed data. Tagging has brought the tools necessary to engage and inform the customers as no other service the boat provides, which produces an educated and excited customer who is more inclined to become a repeat customer. And then there is the science aspect. Scientists have been craving for reliable, obtainable data. Other tagging programs lack the ability or overall desire to share their data, studies or conclusions. 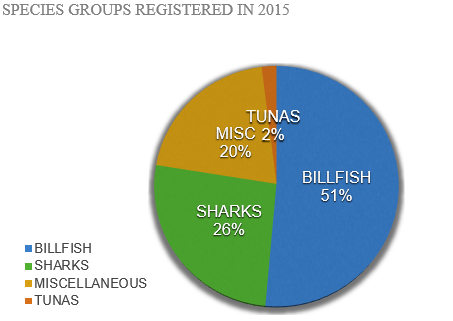 The Gray FishTag Research program will always offer the data collected for free. We continue to bridge the gap between professional fisherman and the science community. A large reason for the success of our program is due to the Official Research Centers, Captains and mates that have collectively worked with us this first year. Without the commitment from The Zancudo Lodge, Marina Pez Vela, Crocodile Bay Resort, Los Sueños Resort and Marina, Grande Alaska Lodge, and more recently Pisces Sportfishing out of Cabo San Lucas, Mexico, and their willingness to educate and offer the tagging program to their customers, we would not have the success we have today. Our contributing sponsors deserve more than a mention as well as they are a huge factor in our achievements, allowing us to keep this program steaming ahead. We look forward to what is to come in 2016.